Argentine authorities have arrested three former policemen in connection with what became known as flights of death during military rule. They are accused of being the crew when French nun Leonie Duquet and rights activist Azucena Villaflor were thrown from a plane in 1977. Their bodies washed ashore and were buried in an unmarked grave until their remains were identified in 2005. Hundreds of political prisoners are known to have died this way. A judge on Tuesday ordered the arrest of former police officers Enrique Jose De Saint Georges, Mario Daniel Arru and Alejandro Domingo D'Agostino. A lawyer and a former navy officer were also detained in connection with the case. Sister Leonie Duquet and Azucena Villaflor, one of the founders of the Mothers of the Plaza de Mayo rights group, were among a dozen women seized by police in December 1977. 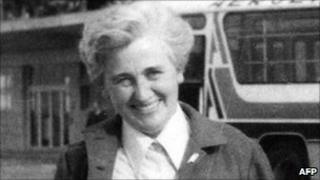 Another French nun, Alice Domon, who also helped the Mothers, was among those kidnapped but her body has never been found. Prosecutors this month called for a life sentence to be passed on former navy captain Alfredo Astiz, who is accused of having a key role in the abduction of the nuns and several other people. Mr Astiz, nicknamed the Blond Angel of Death, is said to have helped security forces by infiltrating meetings of the Mothers at a church in Buenos Aires. He has already been tried in absentia and sentenced to life by a French court for his involvement in the nuns' murder. Between 10,000 and 30,000 people are believed to have been disappeared during the 1976 to 1983 dictatorship.